I am very appreciative of the assistance of fellow researcher Paul Cooper, whose help has been invaluable in identifying the individual in this particular carte de visite as Joseph Paxton. The name written in ballpoint pen on the front face is 'Erasmus Wellsted'. This name is fictional and does not correspond to the individual identified. As mentioned in a prior post, the history of the ballpoint pen also needs to be taken into account. With this additional information we can safely say that the name was written well after the date that this photo was taken. On a recent visit by Paul Cooper to view several of the Auld albums that I have in my possession, Paul identified Joseph Paxton immediately. It so happens that Paul is currently researching Paxton and recognised his photo as being similar to an illustrated engraving that was published in Australian Men of Mark. Further investigation revealed a three page biography (pages 273-275) including the illustrated plate for Joseph Paxton (see below) appeared in Australian Men of Mark Volume 2. Australian men of mark. Vol. 2., Illus. with authentic portraits. Charles F. Maxwell, Sydney. p 273. Joseph Paxton passed away 18 May 1882 and an obituary was printed in the Australian Town and Country Journal the following month. 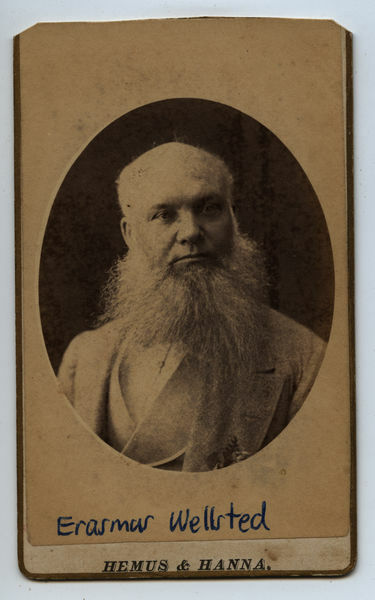 Accompanying this article was an illustration of slightly older Joseph Paxton, which reinforces the identification that has been made of this carte de visite. Research into the Auckland based photographers (see detail below in regards to rear face) puts the age of the carte de visite between 1875-85. The death of Joseph Paxton further narrows this date range down to 1875-82. In regards to placing Joseph Paxton in New Zealand, additional research uncovered by Paul Cooper has also revealed that Paxton left Sydney on 27 November 1876 and arrived back from New Zealand on 7 February 1878. These dates help narrow the time frame down even further to 1877 ±1 year. Painted in Oil or Water Colors. 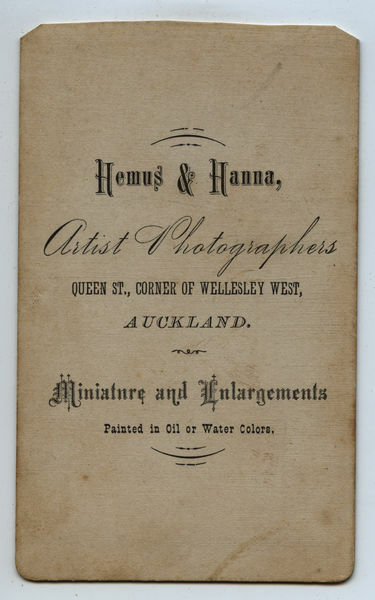 See Hemus & Hanna, Auckland NZ [Photographers] for more information on Hemus & Hanna and their photographic studio in Queen Street, Auckland. As discussed in that post, the documentary evidence based solely on the information provided on the back imprint dates the photo between August 1875 and April 1885.